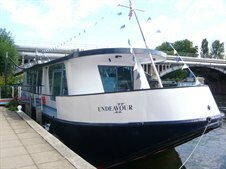 Cattaneo Commercial has just completed the letting of the floating office, Endeavour II, which is moored at Beckets Wharf, Hampton Wick, to a media company on a new 5 year lease. This floating office was converted from a Thames barge and offers two decks of offices totaling 1,665 sq ft of air conditioned space with excellent river views and 4 on shore car spaces. If you are considering letting or selling your commercial premises in Kingston upon Thames please contact Andy Armiger on 020 8546 2166.